Representatives from Brighton and Hove Albion Football Club have made their case for the extension of their Lancing training ground to councillors. The American Express Elite Football Performance Centre, owned by Albion, is hoping to expand into a corner of land to the south east of the site. The proposals, which have yet to be submitted in a planning application, include building a club hub and three additional football pitches on the land. Laura Collins, projects manager for the football club, told members of Lancing Parish Council at a meeting on Wednesday that it would give the women and girls teams a dedicated facility to train in. These teams were currently using facilities at the at the University of Sussex which were ‘not fit for purpose’. “We want to give the women a level playing with the men,” she said. The club hub would include advanced medical and sports science facilities, a yoga and pilates studio and changing rooms, including a changing places facility for people with complex needs. Mark Hooper, head of estates at the club, said the existing training ground had been ‘a huge success’ and was recognised worldwide as one of the best in Europe. “We need to provide the best possible facilities...we want to attract and retain the talent in a very competitive premier league,” he said. When asked about the drainage strategy at the extension, Mr Hooper said that a storage system underneath the pitches would receive all of the surface water before it went into the existing irrigation system. 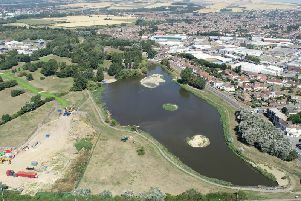 Councillor Geoff Patmore said he feared this could add pressure to the water courses, but was told that the water would drip from the storage system into the water courses at a rate considered acceptable by the Environment Agency. Peter Rainier, principal director of planning at planning consultants DMH Stallard, said: “We can’t give you a guarantee you won’t flood when you are saying you are already flooding at the moment. He confirmed the club would continue to maintain and clear ditches at the site. Councillor Lionel Parsons said he was ‘really against’ the proposal and what he saw as a ‘gradual creeping along the landscape’ to cause ‘a great loss of wildlife habitat’. Mr Hooper said the club had grown and that in 2014 they did not know that the women’s team would go professional. But not all councillors objected to the plans. Councillor Danny Jackson said he was ‘all for’ the extension and that he appreciated everything the club did for the community. He suggested that local children should be able to make use of the new facilities for free. If plans for the extension are approved, the football club hopes that work would begin in the summer.